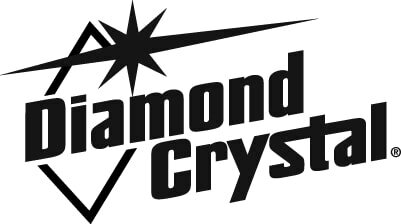 Whether you buy pellets, solar or rock, all the salt you need is under one trusted Diamond Crystal® brand. 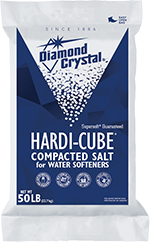 Cargill’s SuperSoft® Salt guarantee is your assurance of quality and their commitment to stand by each and every bag of Diamond Crystal® water conditioning salt. And now the easy-2-handle® Diamond Crystal® water softening salt bags are made from 50% recycled materials. The new packaging contains layers made from reground resin. This helps to cut down on excess waste by 50%. Just one more step toward helping the environment and caring for our future. Keep your shower and appliances running smoothly by transforming your hard water with high purity Bright & Soft® Water Softener Salt Pellets. Our water softener salt pellets contain up to 99.8% pure salt to transform your home’s hard water to soft water. These compacted water softener salt pellets are specially formulated to prevent mushing and bridging in the water softener brine tank—helping to keep your water softener clean and trouble-free. Our patented two-handled bags make lifting and carrying easier than ever. 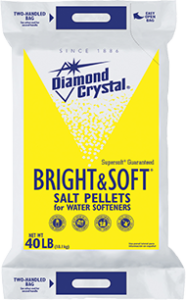 Bright & Soft® Water Softener Salt Pellets are recommended for most water softeners. In addition to hard water, many homeowners struggle with iron in their water supply. Iron can be found in city water supplies and in private wells. Rust stains, where there has been water, are a good indication that you have iron in your water supply. 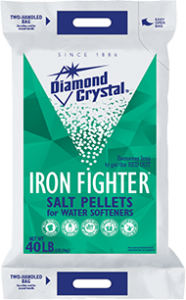 Iron Fighter® Water Softener Salt Pellets are specially formulated for water with high iron content. These 99.6% pure water softener salt pellets help prevent rust stains on laundry, fixtures, sinks and tubs. Virtually 100% water soluble, it also minimizes mushing, bridging and rust buildup in your water softener brine tank—helping to keep your water softener running smoothly. Our patented two-handled, 40 and 50 lb. bags make lifting and carrying easier than ever. Recommended for most types of water softeners, particularly in regions of high-iron water content. High purity salt compacted for extra hardness. The Red·Out® formula product contains and FDA-approved, highly effective rust remover which helps to prevent rust stains on laundry and household fixtures. Recommended for use in all water softeners; available in limited areas. 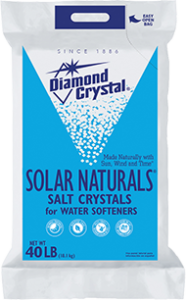 Diamond Crystal® Solar Naturals® Water Softener Salt Crystals have a white, opaque appearance. They minimizing the accumulation of brine tank residue. 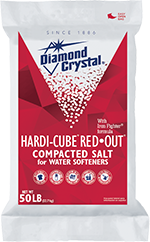 Diamond Crystal® Solar Naturals® Water Softener Salt Crystals are recommended for use in all water softeners. Made with up to 99.8% pure salt. 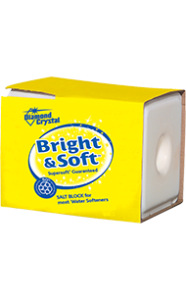 Virtually 100% water soluble, these water softener salt blocks are specially formulated to resist mushing and bridging in the brine tank— helping to keep your softener clean and trouble-free. Our water softener salt blocks are recommended for use in most water softeners, as directed by manufacturer. Made with up to 99.8% pure salt. Virtually 100% water soluble, these water softener salt blocks are specially formulated to resist mushing and bridging in the brine tank— helping to keep your softener clean and trouble-free. 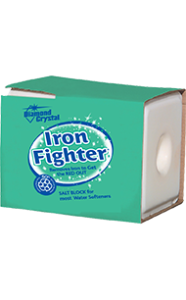 The Iron Fighter® water softener salt block (up to 99.6% pure salt) contains an FDA-approved, highly effective rust remover which helps to prevent rust stains on laundry and household fixtures. The most economical choice in high-quality salt. Dissolves evenly for free-flow through brine tank.